May 17th will mark the 25th anniversary of this little bookstore-that-could. A quarter of a century. It’s remarkable. 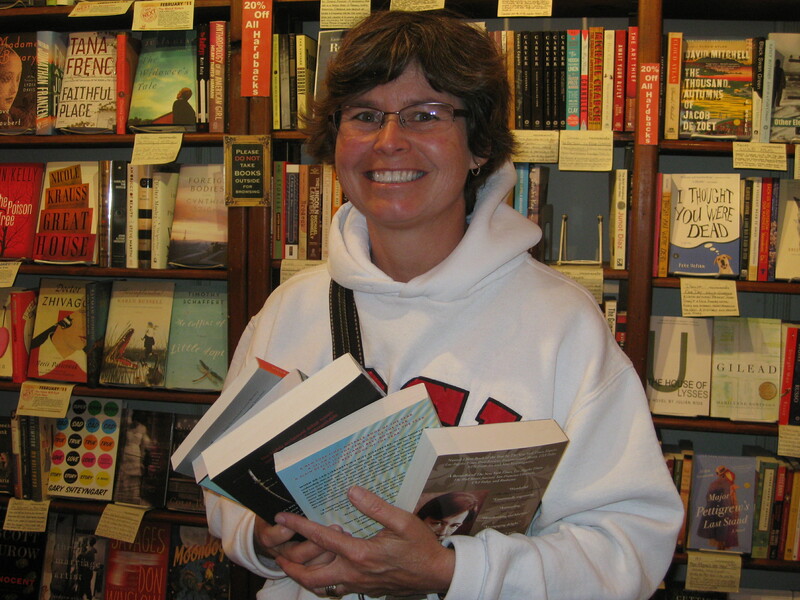 A bookstore housed in a less-than 400-square foot space, where nothing digital has ever seen the light of day (okay, maybe a clock or two,) where no poorly-written book has been given shelf-space, is about to be 25 years old! How have we been able to stick around this long? Dennice Rousey is to blame. Dennice and the hundreds of people like her throughout the years. You see, Dennice lives in San Diego. But we, about 130 miles away, are her bookstore. When she visits her nephew she’s also visiting us. She comes in, stocks up on months’ worth of books and leaves. When she saw our Staff Picks section a couple of weeks ago she was quite miffed that we hadn’t thought to put them on our blog– for her, since she can’t come in every week. I find this relationship absolutely awe-inspiring. That, in this day and age, it’s still possible and can still be nurtured, is really something. Yes, we have great books. Yes, we have knowledgeable and passionate staff. Yes, all the gifts that surround our books are unique and pretty cool, too. But none of it would mean anything if it weren’t for the Dennices of the world, who recognize the beauty of it, who seize it and do whatever they have to (travel as many miles as they have to) to support it. One of the best things about working in a bookstore like ours is that it’s a place where surprises occur, serendipity happens, you read a book about a culture you previously knew nothing about and all of a sudden you’re in conversation with someone seemingly right out of the book… It’s amazing, really. It was one of those quiet, chilly nights here at the bookstore. I looked up to see an elderly couple coming through the door from the cafe. The gentleman had on a grandpa sweater with no idea that it is considered a fashion item among young women today. He wore his sweater with disregard for anything but its warmth and coziness, and it looked as if it had served him well for many years. They both had an air about them that brought to mind farms and countrysides in a time gone by. 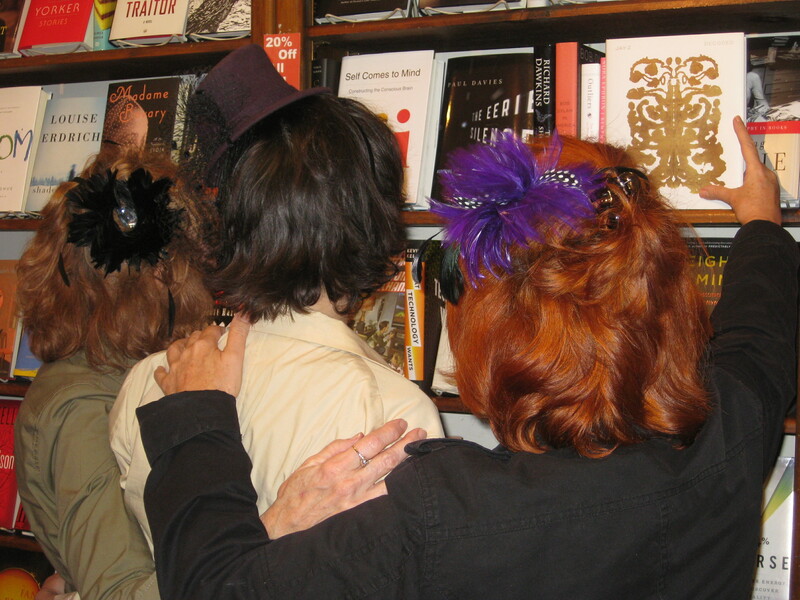 I greeted them and he nodded and she smiled a smile that warmed the entire bookstore. 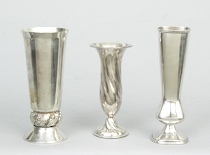 I watched as she examined many of our pretty antiques and then her eyes found our little silver vases. She called her husband over and spoke excitedly in a language I couldn’t place. She showed him the vases, and there was more conversation and nodding, and shrugging on his part. Soon they were both at the counter, with five of the vases, and she said to me, “Which do you like best?” We discussed where it was going to be placed in her house and what she would be using it for, as a bud vase or just decoration. She assessed the height of each vase and then pointed to one and said, “Perhaps this one is too serious, a small vase should not take itself so seriously. 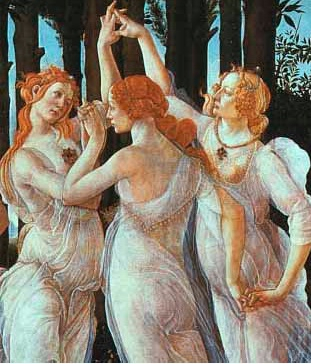 And this one,” she pointed to another, “is perhaps too fragile-looking. I like things to be sturdy, right?” She winked at me. She held a third vase in her hand. “Now this one, I believe it to have whimsy, I think whimsy is a good thing in a vase, don’t you?” Her husband and I agreed. At this point I was completely charmed by them and asked where they were from and if they were visiting L.A. She said, “Romania. Do you know Romania?” I said I had never been there, nor had I ever met anyone from there… but I am currently enamored with literature from Eastern Europe and ho w cool that you’re here! 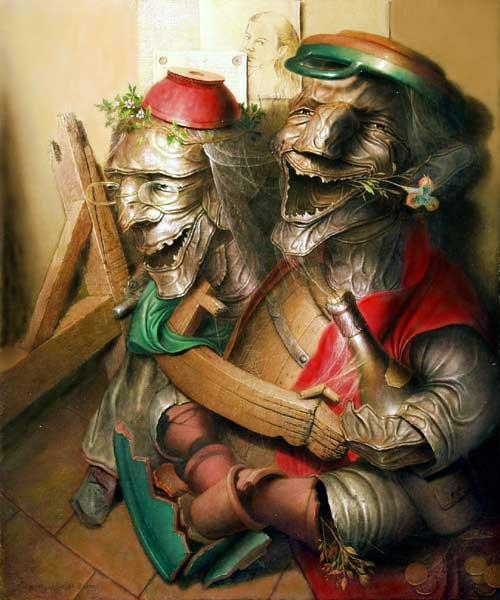 She laughed and said, “Well, now you know a couple of Romanians!” I said, “If all Romanians are as nice as you are I will definitely have to visit that country.” She blushed a bit at the compliment. They continued to discuss the pros and cons of each vase and then their conversation drifted to their grandchildren. They were in Los Angeles to visit their three grandchildren and were thinking of moving here to be close to them, as they miss them so much when back home. She asked if I had any grandchildren, and as they paid for two vases that were deemed to have enough whimsy, she added, “Children and grandchildren are the money we have. That money is better than money.” I thought about it for a minute and told her she was absolutely right. 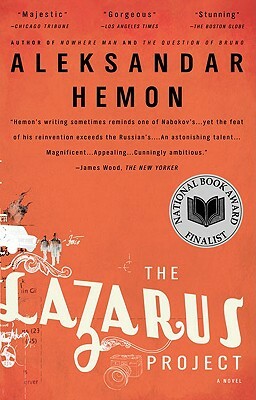 The Lazarus Project by Aleksandar Hemon, is a National Book Award Finalist. It tells parallel stories, one based on true events of the murder in Chicago in 1908 of an immigrant, Lazurus Averbuch from Eastern Europe. The other is a contemporary story of a writer named Brik, also from Eastern Europe, who decides to write about Lazurus and travels to Sarajevo with his friend Rora to do “research”. The writing is original and extraordinary. 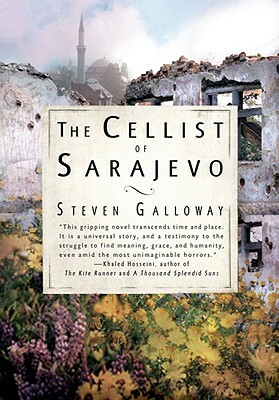 The Cellist of Sarajevo by Steven Galloway is a novel based on true events. During the siege of Sarajevo a cellist plays everyday on a street where twenty two people were killed in a mortar attack. It is his way of commemorating the killings. Inspite of the danger, he plays at the same time everyday. He is the link in the story between other survivors and snipers in a city under siege. Extraordinary book, as well. Last Monday at about 5pm, my office door opens and in pops Lilly’s head. Her face is cloudy but I can almost see the adrenaline rush around in there. She calls me out to her illegally-parked car and asks me to look in through the passenger side window. Inside a temporary pet carrier, snuggled in the far corner, looking to me like it’s sleeping the long sleep, is a little squirrel. I mean really little. 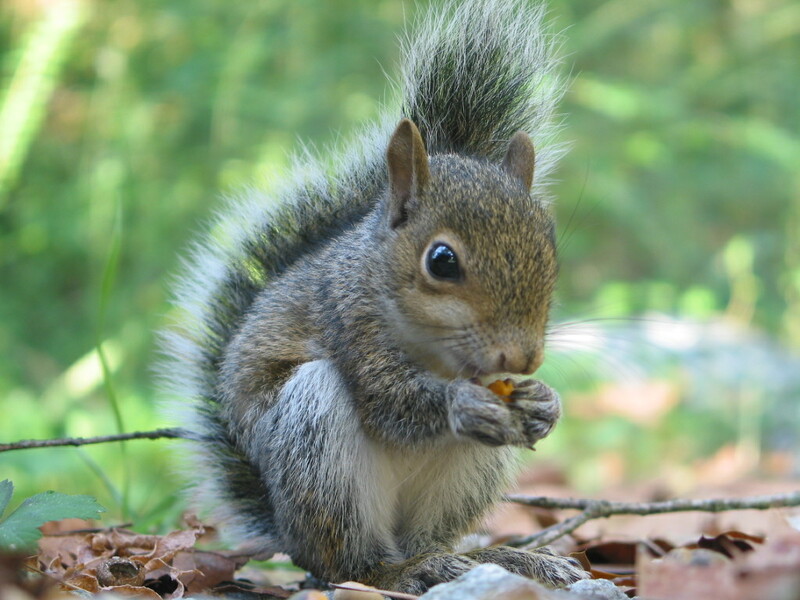 The same kind of squirrel you see scampering up a tree, or sitting there staring at you as you pass by like it’s possessed; the same kind of squirrel you chase off your fruit trees and the same kind you drive past, shielding your eyes from the little display of horror. This little guy had been wandering around, dazed, on one of the busiest streets in Toluca Lake. Lilly, proper, law-abiding Lilly, stopped her car and got out in the middle of traffic and single-handedly made every car whizzing by stop! She carried the squirrel to her car and came rushing to work. “I didn’t want to be late,” she told me. She talked and cooed to the squirrel. So afraid and almost sure that it didn’t have very long to live, she called a local pet clinic and begged them to take the squirrel in so that “at least it will be in a peaceful, loving environment when it takes its last breath.” They told her to bring the little guy in. I so wish you could have seen the relief and joy on her face at that moment. She took the squirrel in. Welll, the squirrel made it through the night and is eating peanuts right now. [The pet store] has calls in to several wildlife rescue places and he’ll/she’ll eventually be in rehab! Ha ha ha! He’s still not well, and may be injured, but he’s still with us. The pet store named him Charlie. Charlie. I thought that suited him. Cute and scruffy Charlie. But what I thought and didn’t want to tell Lilly was that even if there were no broken bones Charlie was still likely not going to be with us much longer. A little body as little as that, having sustained such trauma. Well. I was wrong. Not only is Charlie now called Charlene, but she is with someone Lilly calls the Squirrel Whisperer and is doing so well she will be released into a “tranquil, squirrel-friendly environment” in a few days. Full Disclosure: Squirrel pictured is one of Charlene’s brethren and not Charlene herself. The lovely young woman was almost in tears as she recounted how she and her mother had bought the same ring when her mother was visiting from the East coast and, as time passed, the rings they wore every day would remind them of each other. Now she had lost her ring and could we possibly get her another one? Following this was her description while I tried to draw the ring from her description. Needless to say, this exercise starts with drawing a circle and then listening further. “Sounds like marcasite.” And she is shown similar marcasite at which she nods hopefully. More sketching ensues until a drawing is shown to the woman. Happy ending. The ring came in and it was the right one and the customer was elated and had her sentimental ring replaced… and her mother never knew she lost the first one. There are so many ring memories… A couple approached the counter a few years ago and began joking about the “engagement-looking” rings. The joking turned to a serious discussion about the meaning of rings and the sometimes heavy implications that go along with the gift of one. Before they left the store he had bought her a promise ring and she had chosen one for him as well. They were officially engaged to become engaged and I felt like an old-fashioned matchmaker for no reason other than I sold the rings and was privy to their entire conversation, which had taken place in front of me at the counter. From joke to no-joke, it was an important event for this couple. Another couple chose rings one evening and said vows to one another in front of the counter. I stood there with moist eyes (weddings always make me tear up,) and acted as witness to their ceremony. They still come into the bookstore and seem to be happily wed. And then there was the time an older woman was looking at rings with a young man I assumed to be her son. She left to go to the ladies room and he handed me a ring, credit card, and said “Can you gift wrap it before she gets back?” I rushed to get it done before she returned. When I handed him the package I remarked that I hoped his mother appreciates what a thoughtful son she has. He looked daggers at me and replied huffily, “That’s my wife, not my mother!” That cured me of making any assumptions ever again! You might not expect to see a such a large selection of rings on the counter of a bookstore, but there they are in all their glorious bling-y sparkle. Our history with rings goes back about eleven years and started with a few sterling silver Claddagh rings and grew steadily each year, incorporating men’s spinner rings, or “worry rings” as I like to call them, antique-looking 1920’s-style art deco rings, contemporary hip-glam styles and many unusual animal themed rings. I know women who have worn the same ring on the same finger for decades — and not necessarily a wedding ring, mind you. There’s something about the ring that is different from all other kinds of jewelry… the wearer gets to enjoy the sight of them as often as others do and they are worn on fingers that are always flying around, doing the things of life. It’s a daily reminder, a talisman, something small of beauty, a milestone marker– a ring can be so much more than just a ring. That’s why, in the end, it’s not so unusual to have so many of them in a bookstore. “Wolf! Wolf!” cried the little boy. Everyone, hopefully, laughs and we go on to talk about our other gifts or books or life in general. Day after day, month after month, the same scenario, laughter and explanations over the fake spilled food items. Our regular customers have become savvier (though some keep falling for them over and over no matter how many times they’ve seen them,) but we get many new customers everyday, some from continents away. One evening, such a customer was shopping at the store and purchased her items at the counter as we chatted about her home country of Thailand, which I had the privilege of visiting years ago. Her English was certainly better than my complete lack of Thai but it was difficult to understand some of her words. As she said goodbye and was leaving the store she suddenly rushed back to the counter and exclaimed, “Quick coffee spill, quick quick!! !” I gave the usual reply: “Fake….plastic…etc…” She would have none of it. 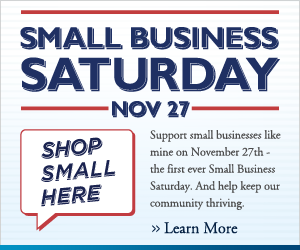 She shook her head emphatically and said, “Come see, quick!” To humor her I stepped from behind the counter to show her our fake coffee cup on the floor, but to my horror and amazement there was a real cup of coffee spilled all over the floor puddling in little rivers, headed for our gifts. I jumped to clean up the mess, but was laughing at the absurdity of the situation and trying to explain to this lovely Thai woman how I had misjudged what she was telling me and still trying to explain about the fake coffee spills that we carry. She laughed but I don’t think she really understood. I think she returned to her country thinking that some American women are very hard to communicate with in an emergency. And I ended up thinking of the little boy who cried wolf until no one believed him when the real wolf appeared.